At some point in the fairly recent past, getting a job as a model meant being plucked out of relative obscurity by a forward-thinking fashion genius (or employee of Tyra Banks) who declared you as a holder of “the look.” Cindy Crawford’s modeling career started with a practical joke. Naomi Campbell was discovered when she was “window shopping” in London. But these days, agencies apparently don’t have time took for fresh faces hidden among us normal folk, so they’ve started going straight to the spawn of models (and other good-looking famous people) they already know. Though Kendall Jenner, the Hadid sisters, Kaia Gerber, and Hailey Baldwin have spent the past year becoming increasingly inescapable names in the modeling world, Anwar Hadid and Presley Gerber are out to prove that nepotism isn’t restricted to famous daughters. 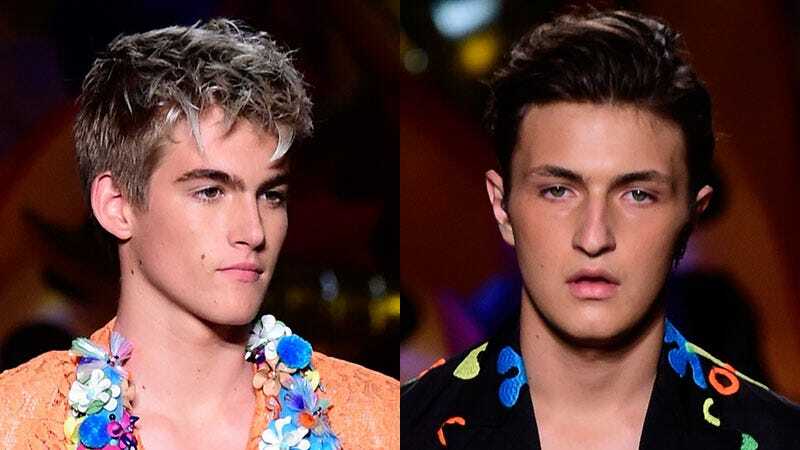 Us Weekly reports 16-year-olds Hadid (the son of Yolanda Hadid) and Gerber (the son of Cindy Crawford) “made their runway debuts at the Moschino Resort show” over the weekend, and now I know how a parent must feel when when one of their kids becomes President, and the other can’t do better than Governor of Florida.